Learn how to navigate administrative systems, maximize efficiency of the prior authorization process, and improve nurse job satisfaction, adherence, and patient outcomes. 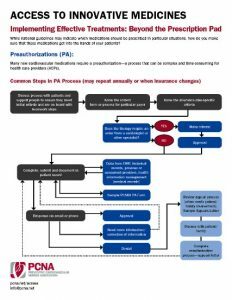 This tip sheet is focused on accessing PCSK9’s, Novel Oral Anticoagulants (NOAC), and new heart failure therapies. 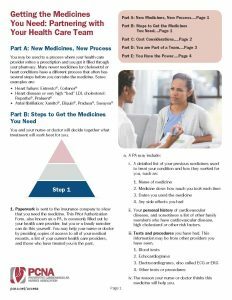 Share this tool with your patients to help them better understand the prior authorization (PA) process, and their role in getting—and taking—innovative medicines. In this 35-minute video, we share all the tips we've collected on how to help patients access the innovative medicines they need. This hour-long video is a recording of our live program on accessing innovative medicines. Learn best practices you can apply to your workplace to improve system navigation. Thank you to program sponsors for PCNA's Access to Innovate Medicines campaign: Amgen, Inc., Bristol-Myers Squibb/Pfizer, Novartis Pharmaceuticals, Sanofi/Regeneron.